Rainy, Secretion, Willing, Swallow, Bones, Steak, Fungus, Aunt Jemima, Satan… a few of these may not even be real words let alone names, yet they are among some of the most popular "English" names adopted by Chinese people. As China becomes more influenced by Western culture in this era of rapid globalization, Chinese society itself is quickly becoming a hybrid fusion of intercontinental multiculturalism. Co-opting fragments of various cultures - a word here, a lyric or look there - is innate among the nation's youth, who are constantly being exposed to new music, movies and other pop-culture influences from abroad. Self-given names are a popular past time among younger-generation Chinese, who seek to use Western words to express their individuality. But as can be expected of non-native English speakers, sometimes the names they choose for themselves are inappropriate, bizarre or laughably bad. Exasperated if not amused by all the odd names she encountered during her three-year stay in Shanghai, American Lindsay Jernigan launched BestEnglishName.com to provide "real" English names for Chinese people. The site was an instant hit among millennials and the post-90s generation seeking legitimate names for their overseas job or college applications. The site receives upwards of 30,000 monthly hits, with more than 3,000 paying users to date having been bequeathed with names. "Many people tend to pick a fantasy name from movies and novels," 25-year-old Jernigan told the Global Times, using Cinderella as one example of a popular name among younger Chinese girls. "But Cinderella is absolutely not a good name. Actually it's not even a real name; Disney just made up the name for its movie." After Jernigan explained this very fact to one of her clients, the young woman decided to name herself "Rella" - an abbreviation of Cinderella. "But I told her that this would just confuse native English speakers even more," Jernigan said. Like "Rella," many Chinese people tend to make up all-new English names for themselves, forgetting that it is no longer English when they do so. "They think that it's okay to randomly pick a few letters and form them into a 'name,' as their Chinese names consist of two or three literally irrelevant characters," Jernigan told the Global Times. Yet few Chinese people seem to care about such things as anthroponymic accuracy. A few years ago, local high school student Wei Shuwei named herself Suvi, which she thought sounded like her Chinese name. But after Wei enrolled in college, her English teacher, an elderly British woman, gently told her that the name might be laughed at by English speakers. After flipping through a name book lent to her by her teacher, she finally picked the more-common name Sylvia. 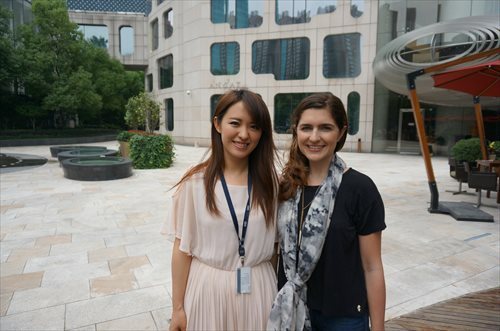 "When I went away to the UK, I realized how important a good English name matters when looking for a job in an English-speaking country," Wei told the Global Times. "Names are a person's first and most lasting impression." Last June, Wei joined Jernigan's team at BestEnglishName.com and is now responsible for the site's translations as well as marketing. "Chinese students are good at coping with English exams, but few know how to give themselves the right English name; Chinese teachers never care about that," she told the Global Times. As recalled by Wei, one day a young woman surnamed Tang approached Jernigan for an English name. "She said she wanted to name herself Sugar, because it is the Chinese transliteration of her family name," Wei said. With some unease, Jernigan had to inform their client that in America the name Sugar, as well as Candy and other sweet things, have negative connotations with strippers and prostitutes. On the website, name-seekers can take a two-minute personality quiz and then receive five suggested names based on their answers. The questions, designed by Jernigan, ask users about their favorite things such as flowers and colors, which to some extent can reveal a person's personality. For users who are more serious about obtaining a lifelong name, Jernigan offers online or face-to-face consultations. For these clients, Jernigan requires a detailed questionnaire and often provides them with a list of 10 to 15 choices. "If someone is still unsatisfied with those names, I would suggest that they take a deep breath and relax," she smiled. After hundreds of consultations, Jernigan has found that Carson, Lexi and Alyssa are among the most popular names liked by young Chinese, though she has no idea why. As a native Chinese, Wei knows that Chinese people don't want all-too-common names such as David, Matt or Lucy. "I've suggested to Lindsay not to give our clients options like these, because few Chinese would want such a simple and common name." Many Chinese also want a name that no one else has had before in order to stand apart from the masses. "A unique name may be good in China, but it's weird in English-speaking countries," Jernigan said, adding that some of her clients have specifically asked for ultra-unique English names. "They are seeking an English name, but they still have a Chinese mindset." Parents are also among their clients, who want to give their baby an English name to help jump-start their language abilities. "Chinese parents usually take a lot into consideration when naming their baby, such as the five elements (wood, fire, earth, metal and water) and fengshui (a Chinese philosophical system to govern spatial relations)," Jernigan said. "Western parents, on the other hand, care more about the feeling of a name: is it a classical name or a trendy one? Does it sound good? Most of the time they don't care much about the meaning." Globalization is making the world smaller, and as English continues to establish itself as the language of the world, more and more Chinese are giving themselves English names. But as Jernigan says, doing so should not be taken lightly. "It (giving an English name) looks easy, but it takes a lot of learning," Jernigan told the Global Times. "Even if you know how to speak English, you might be confused by the names. It's more about cultural and social understanding, not just the language."